Want to know what CEO Stephen Elop thinks about the past, the present and the future of Nokia. Here are some memorable quotes from his D9 interview with Walt Mossberg. 1. Poor Nokia is tanking while it moves to Windows Phone. Walt Mossberg: "It's a painful transition." Elop: "It certainly feels painful right now." 2. 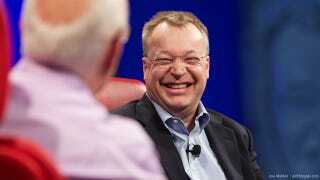 Elop is not a plant for Microsoft. "No, The Trojan horse theory has been well overplayed," Elop said. "I refer you to the grassy knoll for that one." 3. Symbian was so slow that Nokia had to kill it. "With Symbian it's going to take too long," Elop said, "it's crufty." " We felt we could differentiate better with Windows Phone. We can do a lot" (with Windows Phone). "There's absolutely no discussion. The rumors are baseless. It is as clear as that." 6. Nokia will be everywhere, available for everyone! "In the first launch you'll see the first device, but then a whole family of devices. We'll be at many price points all over the world." 7. Nokia blew it in North America. "We used to have a 30 to 40% market share." Then flip phones started getting popular in North America and Nokia had no interest in making flip phones. "A great deal of market share quickly evaporated." 8. Forget about devices, it's the Cloud FTW. "It's no longer a war of devices, it's a war of ecosystems." 9. Crikey, he bought a cheap Chinese knockoff. "I bought my son an iPhone running Android" while shopping in Shenzhen. 10. Nokia and the tablet.